Bobby's burgers hit a royal note for DC's burger lovers. 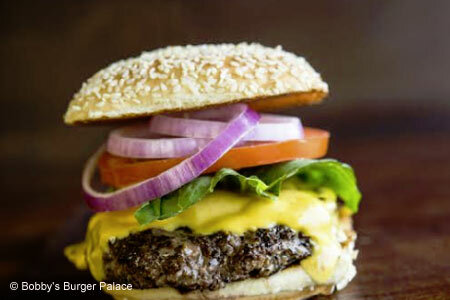 : The word “palace” suggests something grand and elegant, but Bobby Flay’s burger joint in DC is funky, with its bright, bold colors. However, in terms of killer burgers, it is grand, indeed. Like most such eateries, BBP pairs several variations of burger styles, so if you like your patty dressed up with, say, queso sauce and some pickled jalapeños (the Santa Fe burger), with provolone and griddled onions (the Philadelphia burger), or with ham and Swiss cheese (the Miami burger), you’ve come to the right place. You can even request the degree of doneness --- medium-rare, of course. But the meal is not over yet: must-eats are the sweet potato fries with a honey-mustard dipping sauce and the thick-and-just-crunchy beer-battered onion rings. Finally, beverages include several beers, wine, iced tea and cactus pear margaritas. Among the milk shakes, the best flavor is the blueberry-pomegranate, with a subtly fruity sweetness, but chocoholics will applaud the richness of the dark chocolate. If you don’t plan to work after mealtime, spike the milk shake with bourbon, rum or vodka. Other locations.